And just like, he's three! 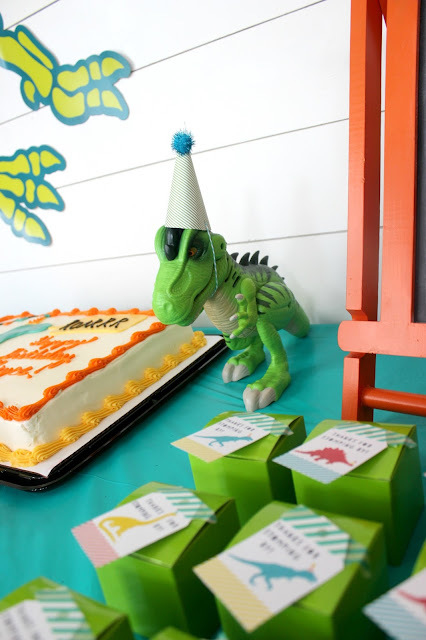 This past weekend we celebrated Little B's big day with a fun and budget friendly Dinosaur birthday party. 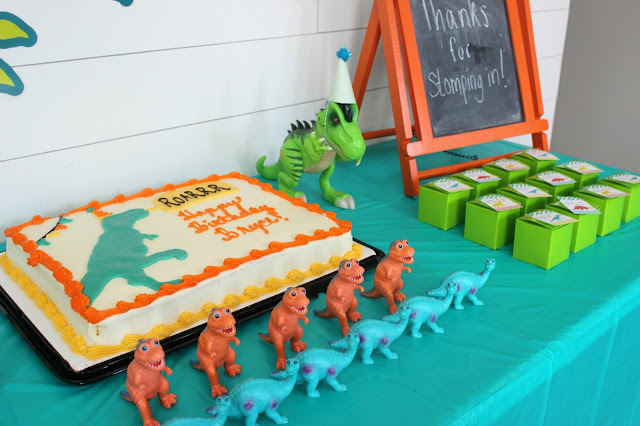 I really simplified the party planning this year but was still able to throw a fun-filled get-together. Unlike Little B's first birthday bash, or shall I say "pawty", this one was a lot more low key in the decor department, which in turn, meant I walked away from this party with most of my sanity still intact. Our bare nekked faux shiplap wall in the kitchen was the perfect backdrop for the cake and party table. A farmhouse dinosaur, right up my alley! 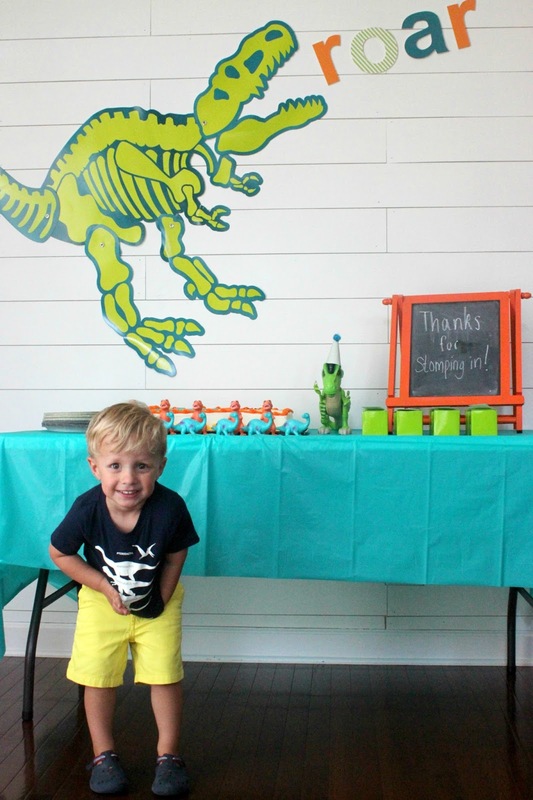 Little B has been telling me since December that he wanted a "T-Rex" party, so I was supersaurus excited (see what I did there) when I stumbled upon this large dino cutout from Oriental Trading. 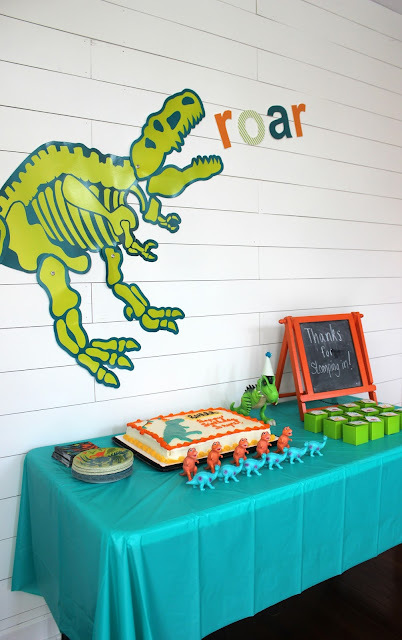 It seem only fitting to have our dino roaring too, so I picked up a few craft letters from Michaels and used some scrapbook paper from my craft stash to dress them up a bit and to coordinate with the party colors. The orange chalkboard easel was a purchase from Hobby Lobby a few years ago. 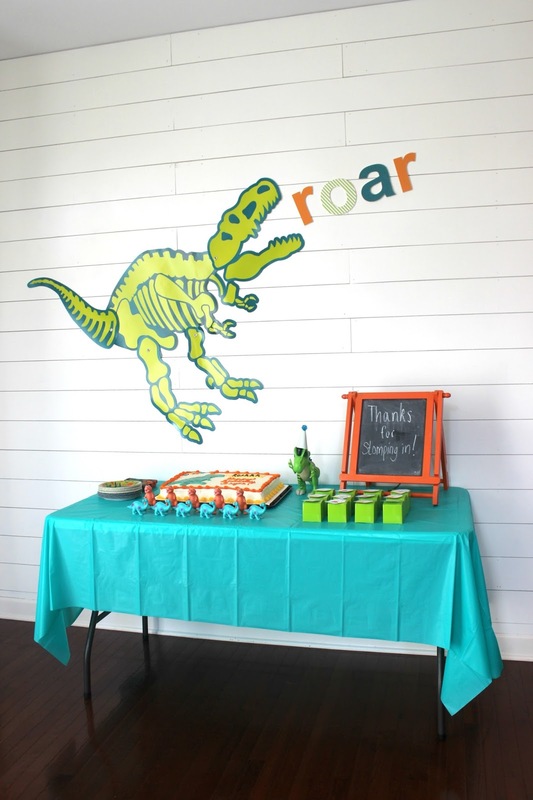 One day soon I'll be sharing a handful of tips of how I save on all my party decor, but using household items you already have is always one of the biggest pocket-friendly ways to save dough! Party favors are always my favorite detail to work on. Although not necessary, I love giving them out and trying to challenge myself to come up with cute ideas to match the theme. This year I just simply boxed up packets of dinosaur "Jurassic Park" fruit snacks. I found boxes of them on sale at our local Target, but Amazon sells them in larger lots too. 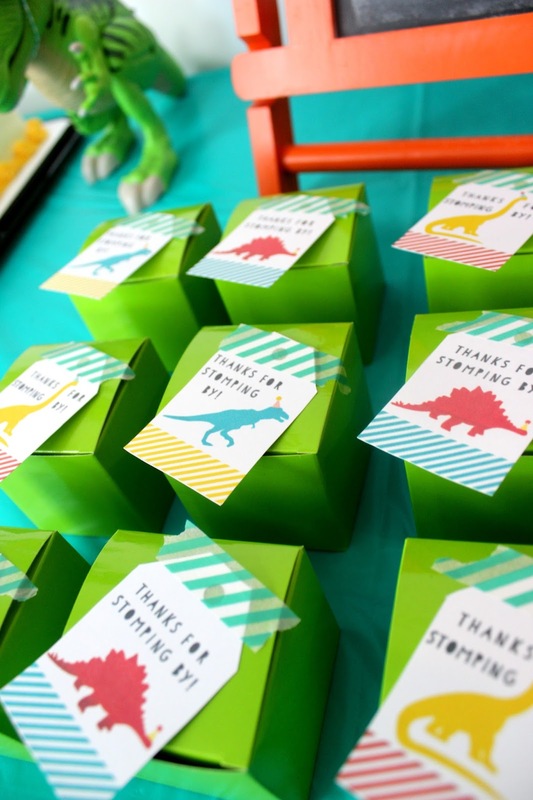 The "Thanks for Stomping By" tags were an adorable addition from Paper Kites Designs on Etsy. This was the first time in years that I didn't create my own invitations or paper goods. In all honesty, time got away from me and before I knew it June was over and I only had about a week and a half to plan this party! Thank goodness for printables! 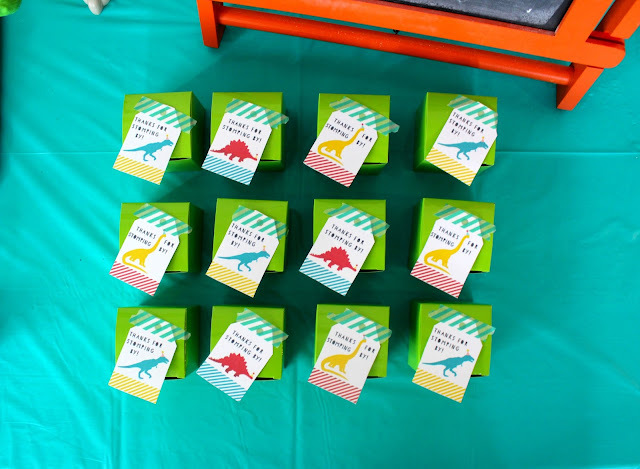 Each kiddo also got their very own dinosaur to adopt and take home. I found them at the Dollar Store and how cool that they matched our party colors? I tell you year after year, the DS has really come through for me when it comes to my party themes! The orange ones look a tad drunk but hey it's a party, right? 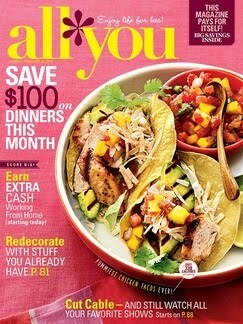 These were a huge hit with the kids! Aside from a "T-Rex" party, the only other request Little B had was for a "T-Rex" cake. 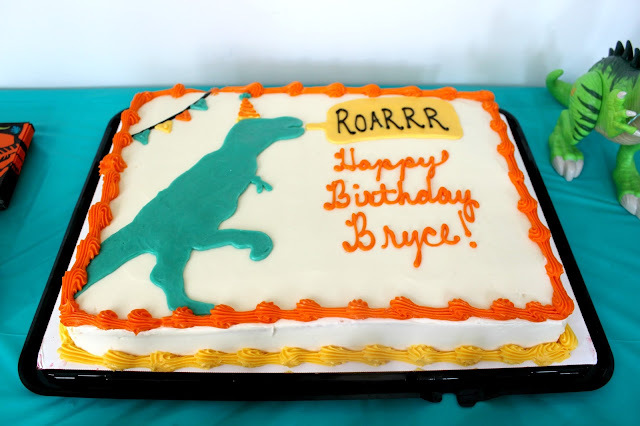 I originally had plans to do something like this but then he started talking a lot about how he wanted to eat the head of the "T-Rex" and well, I had to resort to plan B. 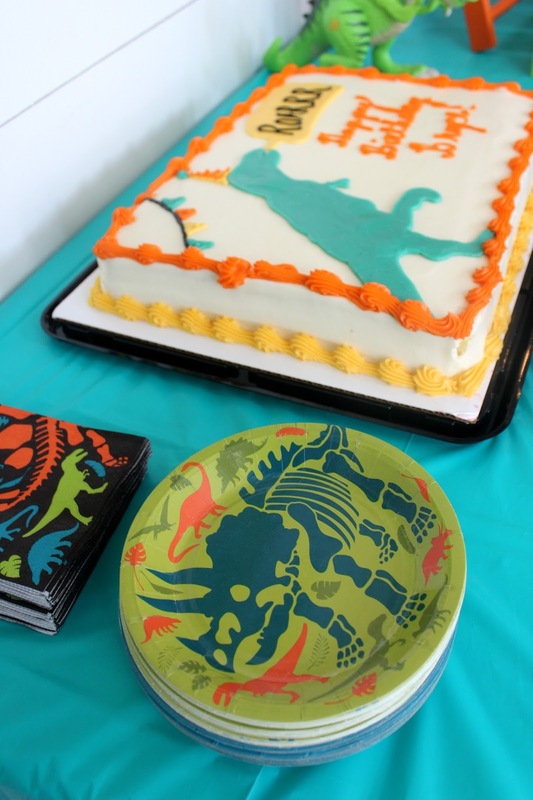 We got the cake from a local grocer and just had them match our party invitations. I think it came out so cute! 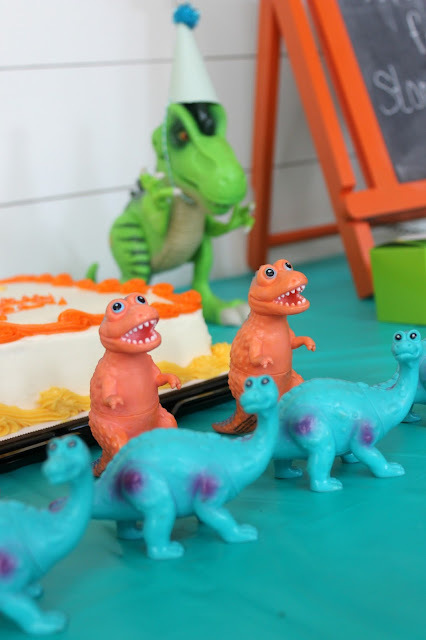 Even some of Little B's dinosaur toys got in on the party action with handmade mini birthday hats! He LOVED these so much I had to spend the morning of the party making little hats for all his other dinosaurs. That about sums up the party decorations! I did fail to snap pictures of the outside decor which consisted of a mini refreshment area on our potting bench that included "Swamp Juice" but as you can see I REALLY contained myself this year and I had to admit it felt refreshing to not stress myself out with millions of details! And the most important thing was that Little B had a blast, and that's all that matters, right? Hope you enjoyed a mini snapshot of our weekend celebration! **This post contains affiliate links, which means if you decide to make a purchase through my link, I will receive a small commission for it. 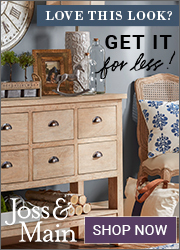 This does not cost you anything additional. This in no way affects my opinion on these products. Thanks for supporting my this blog (and my cheap wine habits). Thank you so much for sharing pics and linking to my shop! The favors are adorable and I am dying over that cake!